Description: This woody vine branches occasionally and can reach 50' in length. Boston Ivy can easily climb tree bark, wooden fences, concrete masonry, and brick or stone walls. In the absence of such supportive surfaces, it sprawls across the ground. The lower stems of mature vines are brown and woody; they can span several inches across and form small brown rootlets that can cling to various surfaces. The upper stems are hairless and vary in color from green to bright orange-red; they produce branched tendrils that have suckers at their tips. These suckers are shaped like small disks and can cling to various surfaces as well. Immature plants that are beginning to develop have trifoliate leaves. However, mature plants produce simple alternate leaves along their stems. 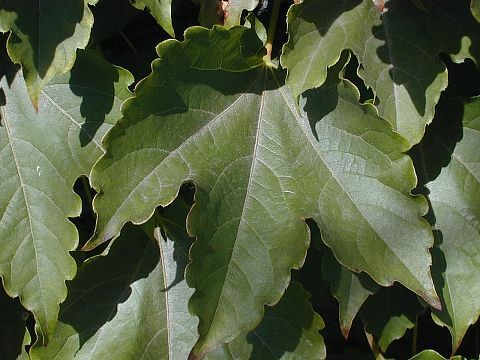 The mature leaves span up to 6" long and across (excluding the petioles). They are cordate-oval, palmately lobed (usually with 3 lobes), and crenate or slightly undulate along the margins. Their upper surface is medium to dark green, hairless, and rather shiny. Young leaves of mature plants are similar, except they are yellowish green and coarsely dentate along the margins. The petioles of these leaves are long and slender; they are usually light green, but may become bright orange-red during the fall. Occasionally, cymes of flowers are produced from the axils of the leaves. Each cyme can span up to 4" across and long. Each yellowish green flower is about ¼" across, consisting of 5 green petals, 5 stamens with yellow anthers, and a central pistil. The sepals are absent or insignificant. The blooming period occurs during the summer and lasts about 2-3 weeks. The flowers are usually well-hidden in the foliage. Each fertilized flower can produce a juicy berry about 1/3" (8 mm.) long that contains 1-3 seeds. The berries are dark blue with a whitish bloom and globoid in shape; their stalks are yellowish green, brownish green, or dull orange-red. The root system consists of a stout woody taproot. Cultivation: Boston Ivy prefers full sun to light shade, slightly moist to slightly dry conditions, and a fertile loamy soil to support its rampant growth. It will tolerate soil containing clay or stony material. Flowers and berries are more likely to be produced if there is some exposure to sunlight. Range & Habitat: While commonly planted as an ornamental vine, the non-native Boston Ivy has rarely naturalized in the wild in Illinois. According to official records, it has naturalized in Hancock and Kane counties; the webmaster has observed escaped plants within the city of Urbana, Champaign County (see Distribution Map). Habitats include areas along railroads (including the gravel ballast) and areas along bridges. Boston Ivy is originally from East Asia. It is rather surprising that this introduced vine hasn't naturalized in more areas of the state, as it is a rampant grower and produces berries readily. However, some cultivars may be more productive of flowers and berries than others. Photographic Location: Along the brick wall of a building in Urbana, Illinois. Nearby, escaped plants of Boston Ivy were growing near an old bridge that spanned a large drainage ditch. Some of the vines were clinging to the concrete masonry of this bridge. Faunal Associations: Information about floral-faunal relations are unavailable for North America. However, it is likely that they are similar to the floral-faunal relations of Parthenocissus quinquefolia (Virginia Creeper). In particular, the berries of Boston Ivy are occasionally eaten by songbirds, which can disperse the seeds to new locations. Comments: Both the foliage and berries are attractive, especially when growing along the walls of a building. However, because this woody vine is originally from East Asia, it shouldn't be introduced into natural areas where native species could be displaced. Boston Ivy is fairly easy to distinguish from Parthenocissus quinquefolia (Virginia Creeper), because the mature leaves of the latter are palmately compound (usually with 5-9 leaflets) and the stalks of its mature berries are bright orange-red. The mature leaves of Boston Ivy are simple and the stalks of its berries are less colorful. Both of these species produce suckered tendrils. It is possible to confuse Boston Ivy with many Vitis spp. (Wild Grapes) because they are woody vines that produce simple leaves with 3-5 lobes. 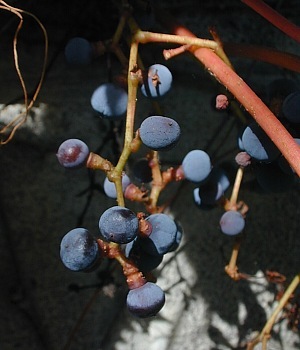 However, the tendrils of Wild Grapes don't produce disk-shaped suckers at their tips. Furthermore, the flowers of Wild Grape have a different appearance: They are golden yellow from their strongly exerted stamens, while their petals are much reduced in size and insignificant. Like Virginia Creeper, the flowers of Boston Ivy have conspicuous green petals that resemble sepals.